An exhibition using plastic collected on beaches around Wester Ross and Shetland and used as a warning about the future of the marine environment opened at An Talla Solais Gallery in Ullapool last weekend. 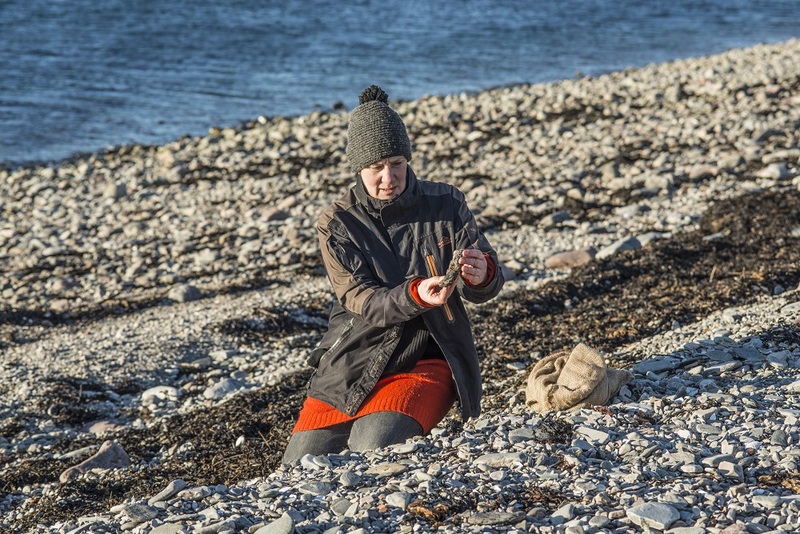 Julia Barton’s NEO Terra exhibition is the culmination of four years of research which began in Ullapool and has taken her to 60 beaches from Gairloch to Cape Wrath since. Later this year the work will travel to the Scottish Parliament in Edinburgh to highlight the impact of marine plastics to ministers and MSPs. The centrepiece of the exhibition is a large floor-based ‘map’ featuring islands using ‘rocks’ made from melted plastic. These ‘plastiglomerates’ are now common on some beaches as people burn the waste they find and Julia has collected thousands of them. NEO Terra also includes an interactive area where visitors are invited to take a closer look at the collected beach samples through microscopes. Julia (pictured) hopes the work will make people think about the volume of plastic seeping onto our shores and how long it will remain there damaging the environment. “What you actually see on beaches is just the tip of the iceberg and nothing compared to the unseen particles which break down into sand grains,” she said. “The lifespan of these materials outlives us, our children and our grandchildren. It’s insidious and we need to address how it got there. Julia hopes her creative perspective on a serious environmental issue might connect with new audiences. The exhibition runs until 30th June and the gallery is open daily from 10am to 5pm. Support has come from the National Lottery through Creative Scotland.